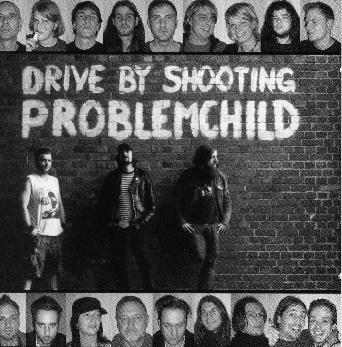 Drive by Shooting - "Problemchild"
Drive by Shooting is a down and dirty punky rock and roll band from Berlin. We saw them earlier this year when they were opening for Marble Sheep, but this is the first stuff I have heard of them since the 7" record with Rotor and a couple of other German bands. The CD features 12 tracks in 34 minutes and most are 3 minutes or under except for the last track. There is some organ on a couple of tracks as well. Short and to the point tracks with some raw production and jamming on the guitar, not just all riffs. The people into raw, dirty, a bit nasty and just down right rocking will dig this. For more information you can visit the Drive By Shooting web site at: http://www.beap.de/dbs.